Graeme Obree could enjoy his record only one week. 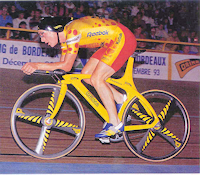 The olympic champion from 1992, Chris Boardman, was the first man to break the 52 km/h barrier. He used a more or less “standard” Corima bike with trispoke wheels. Another “fast start, then slowing down” attempt. 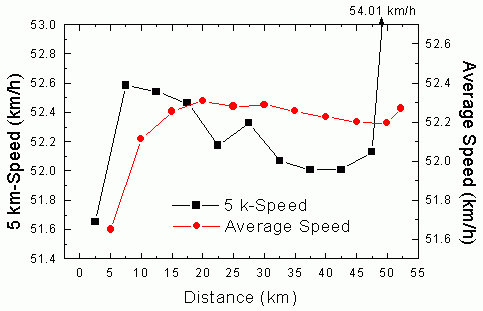 Starting with almost 52.6 km/h, he slowed down more and more to almost 52.0 km/h. Towards the end of the hour he could increase his speed again, reaching more than 54 km/h in the last two kilometers.